Book tickets to What’s Your Story? What’s Your Story? Is an 7 session Creative Writing Workshop where children can exercise their creative faculties, indulge their love for reading and writing, and explore their own writing skills across different genres in Poetry, Fiction and Non-Fiction- from creating unique characters, understanding the importance of setting and plot in fiction, to exploring the genre of play writing where you give characters dialogues, exploring world-building through adventure/fantasy writing, the workshop has a wide range of exposure and fun! 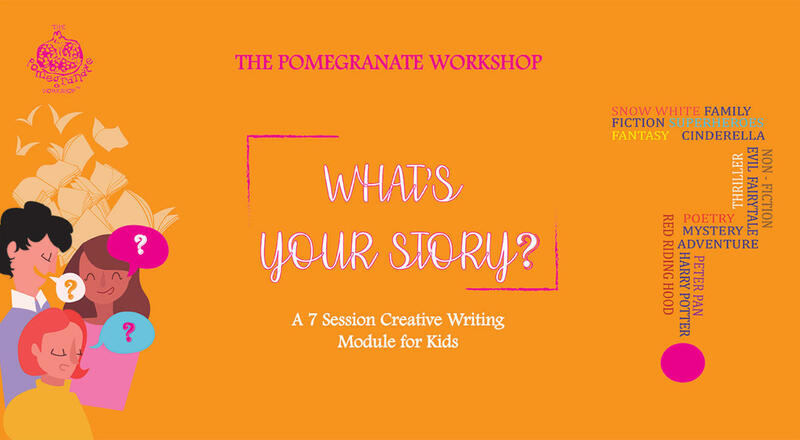 Over the course of this workshop, children will gain exposure to a wide range of literature, discover new forms of story writing, and realize their own writing potential under the guidance of our faculty. From ideation to accomplishment, What's Your Story? Provides children with a unique opportunity to explore the subtle craft of creative writing with accomplished facilitators. Our faculty consists of writers, educationists and language experts. Our facilitators include Akshat Nigam is a writer, educator and storyteller. His storytelling performances include 'East of the Sun, West of the Moon' and 'An Uneasy Truce: Stories about Fear' among others. He received the Hindu Playwright Award 2017 for a play he co-wrote, titled 'In Search Of Dariya Sagar'. He has conducted several writing and filmmaking workshops with children across the city. Apeksha Harsh holds an MA in English Literature from The English and Foreign Languages University, Hyderabad. She also has an MA in Writing from The University of Warwick, UK. Apeksha’s work both short stories and poetry have been published in Under the Radar, Ambit, Fusion, Here Comes Everyone and Eunoia Review. During her time in the UK, she penned the Japanese folktale-based opera Kaguyahime for Operamus. She also taught creative writing to Grade 3 students at St John’s Primary School, Coventry as part of the Warwick Writing Programme in Schools (WWPS). Later, she worked with Writing West Midlands as an Assistant Writer for the Polesworth Write On! Writing Squad. A 7 session module conducted on the given Saturdays, A creative writing workshop where children create unique characters, understand the importance of setting and plot in fiction, explore the genre of play-writing where you give characters dialogues, explore world-building through adventure/fantasy writing, this workshop has a wide range of exposure and fun!